This weekend I won’t have much time to write. I’ll be off enjoying a weekend of pipes, drums and good friends. What feels authentic for me is doing the things that I love. One of those things, which took root around the age of four, was the desire to drum. As a child I quietly obsessed over drumming, doing everything I could to learn by proxy, because in the 1960’s the idea of a girl playing the drums did not sit right with my parents, especially if the girl was me. Except for my dear Grandpa, I was pretty much discouraged from playing drums until Karen Carpenter came on the scene and my parents had to concede that just maybe it would be okay for me to take up drumming. By this time I had already made a drum kit in the basement using cardboard boxes and my dad’s table saw blades for cymbals. I was ready to be taken seriously. Through the years, I have been drumming on and off on a casual basis, jamming with friends, occasionally playing out at parties and public venues. 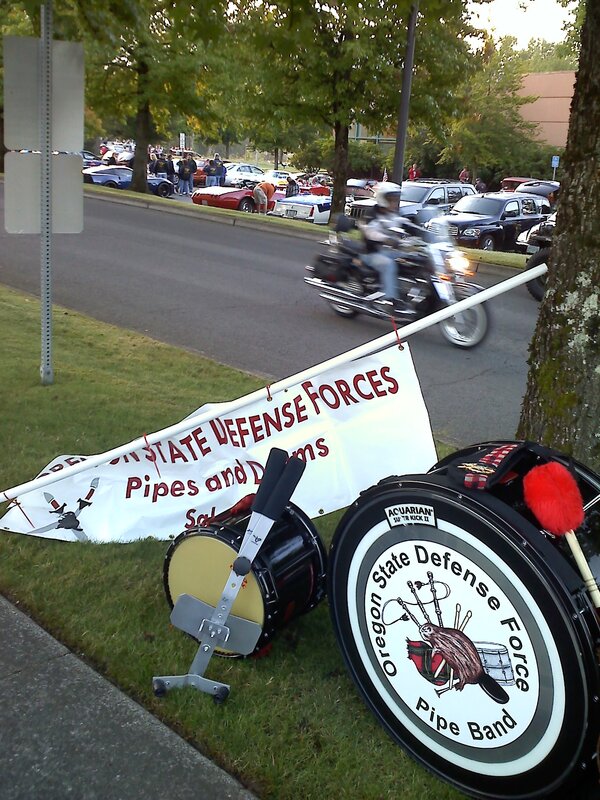 So, I am off this weekend to play once again with the Oregon Defense Force Pipe band at the Portland Highland games and then again on Sunday at the Salem Art Fair. Happy weekend everyone! Deb, this is great. I didn’t have a chance to get back to your last comment on my board. I’m only now stepping back onto WP. 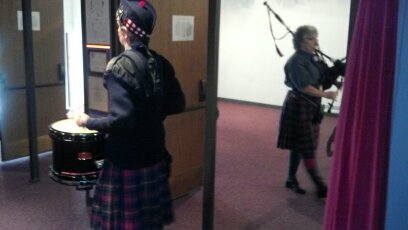 T (8 yrs) told me the British played the pipes in the Revolutionary War (uh, who learned something new today?) We enjoyed the videos. What a precious glimpse into your history. Aw, thanks so much Diana! 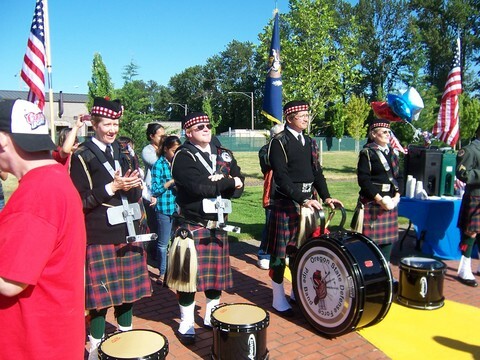 There’s quite the community of pipers and drummers here in the Pacific NW and Canada. So glad you enjoyed the videos. My drum class/circle is focused primarily on the djembe and the Dun-duns…the Dun-Duns are my favorite because you can kind of dance as you play them. I love having an excuse to beat on something with precision and passion on a regular basis – so cathartic! Our intimate circle of 10 or less has been around for 20 years, and it is definitely a highlight of my week – makes every Monday night special. I choose quality over quantity any day and I am so happy to have found you on here!! Here’s Karen Carpenter and quality of living and our friendship! Slainte!